On Fridays, after a regular practice session, our shala is open for quiet meditation. This is a new experience for me, even as I’ve read much about the mental and physical health benefits accrued by experienced practitioners. As someone who is totally exhausted after practice – indeed, I couldn’t move another muscle even if I wanted – I always think it will be easy to settle in, and pass 30 minutes in quiet stillness. Sure enough though, even as my body is spent and motionless, my mind starts to wander, and wander, and wander some more. “Damn”, I think, “here we go again”. Just a few minutes in, and I’m losing a battle – with myself. “This is going to be the longest 30 minutes of my life!” What to do? Some experts say to simply LABEL your thoughts and feelings. Just find a word to place on the thought or feeling – and then – let it go. Does this really work? How does this trick work? Indeed – the words – the words – as in, “In the beginning was the Word, and the Word was with God, and the Word was God.” WORDS. Do I know enough words? How many words are there anyway to describe all the possible feelings that a person can feel? How many do you know? Check this list out. There are more than 3,000 words in the English language to describe various feelings. 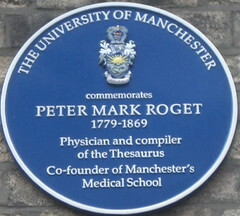 Thank you Peter Mark Roget (who, ironically, worked on the first thesaurus as a means to cope with negative feelings associated with depression). I will bring my thesaurus – full of these tools to help me label my feelings – to meditation practice from now on!